Islamist militants have attacked Nigerian police in two more northern states, after at least 39 people were killed on Sunday. Eyewitnesses told the BBC a gun battle had raged for hours in Potiskum, Yobe State and a police station set on fire. A self-styled "Taliban" group which has staged previous attacks also clashed with the security forces in Maiduguri, capital of neighbouring Borno State. A curfew has been imposed in Bauchi city after Sunday's violence. Sharia law is in place across northern Nigeria but there is no history of al-Qaeda linked violence in the country. Nigeria's 140 million people are split almost equally between Muslims and Christians and the two groups generally live peacefully side by side, despite occasional outbreaks of communal violence. 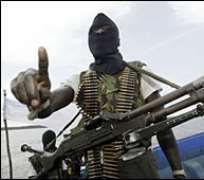 Militants chanting "God is great" attacked the Potiskum police station at about 0215 local time (0115 GMT) - the same time as the Taliban launched their raid in Maiduguri. The police station and neighbouring buildings have been razed to the ground, eyewitnesses say. People are reported to be fleeing central Maiduguri. Security is said to have been beefed up in Plateau State, to the south of Bauchi, where hundreds were killed in clashes between Muslims and Christians last year. It is not clear if Monday's attacks are linked to the violence on Sunday, which was carried out by a different group. However the BBC's Ahmed Idris in Abuja says both the Taliban and Boko Haram, the group in Bauchi, campaign against Western-style education. The security forces have confirmed the attacks but have not released any casualty figures. Medical sources have told the BBC that two police officers have been taken to hospital in Potiskum. The Taliban came to prominence after attacking police stations in Borno State in 2004.